Both of these signs are people pleasers, so there will be a lot of giving in this relationship. Virgo serves, and Libra knows all the steps to the social dance. 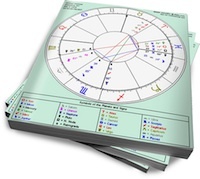 However, practical Virgo’s veggies-first approach may leave romance-loving Libra wanting a little more sugar. Sun in Virgo is here to get the job done right. Maximum efficiency is his MO; when he offers advice to his lover on the best way to load the dishwasher, he’s showing that he cares. Sun in Virgo is not big on hearts and flowers (waste of money). He rather go for a brisk hike (it’s good for you) than lie on an exotic beach (waste of time and risk of skin cancer). But he truly wants to help his partner in any way he can. Moon in Libra needs to swoon from time to time. She’ll give to her partner without complaint, but she needs some appreciation (in the form of a tasteful, romantic gesture) in return. She’s in love with the idea of courtly romance; all class, nothing vulgar. She is ruled by Venus, after all. When Moon in Libra feels unappreciated, it’s usually because she’s submerged her own needs in favor of her lover. Shadow Libra then emerges as quietly resentful and passive-aggressive. Moon in Libra will appreciate Virgo’s extreme cleanliness and politeness. Sun in Virgo will notice Libra’s helpful support of everything he does, and will think that he’s found the perfect companion. He’ll completely overlook her hurt feelings when he gives her a juicer (on her birthday) instead of the perfume she was quietly hoping for. He’ll wonder why she’s moody, and will probably be clueless until she delivers a few angry barbs. Then, Virgo will feel guilty (and apologize) and Libra will feel justified. Until it happens again. And it will, unless Libra learns to vocalize her needs, and Virgo learns to broaden his concept of giving.